Cancellation Policy for 1-2 Rooms - 72 hours prior to check in date to avoid penalty of 1 nights room charge. Cancellations made 24 hours or less prior to arrival will be charged for the entire reservation. PLEASE NOTE: If you booked the Early Booking Special there is a 14 day cancellation policy. For all Holiday and Special Event dates there is a 14 day cancellation policy the credit card will be charged in full. PLEASE NOTE when reserving 3 or more rooms there is a 14 day cancellation policy notice or the credit card on file will be charged in full. check in date. If we do not receive another form of payment by the 4th day prior to your check in date your reservation will be cancelled. Please note that if you booked the Early Booking Rate your credit card is charged in full at the time of making your reservation. PLEASE NOTE THAT IF ANYTHING IS DAMAGED, BROKEN OR MISSING FROM THE PROPERTY AFTER CHECKOUT THE CREDIT CARD ON FILE WILL BE CHARGED ACCORDINGLY. FURTHER, OUR PROPERTY IS A NON-SMOKING PROPERTY AND SHOULD YOU SMOKE IN THE ROOM YOU WILL BE CHARGED $150 WITHOUT EXCEPTION. Although Jet Luxury Resorts manages exclusive units within these properties, these rooms are the same rooms as the hotels' and all check-in/ check-out procedures are the same through the hotel’s front desk. Please note you will be charged directly by Jet Luxury Resorts for your room accommodations (this will show Jet Luxury Resorts,San Diego on your credit card statement.) Further, please note that you have booked your stay with a third party management company and all correspondence regarding your booking needs to be directed to Jet Luxury Resorts and not to the property itself. Jet Luxury guests receive the guaranteed best rate and elite access into exclusive inventory at The Vdara Hotel Las Vegas. All hotel amenities are provided with your reservation.The Vdara Hotel and Spa is an all-suite Las Vegas luxury rental boutique condo-hotel with 5 Star amenities and a sophisticated international flair that appeals to guests who love the energy and excitement of Las Vegas, but who choose to experience luxury in an exclusive non-gaming, smoke-free environment. The Vdara offers contemporary interior spaces with sleek 5 Star modern hotel amenities and concierge services, a rooftop pool, lounge and spa and an atmosphere bound to surpass all expectations.The Vdara luxury hotel is connected to The Bellagio and adjacent to ARIA Resort & Casino, steps away from shopping centers and gourmet restaurants. It is located at the new City Center, Las Vegas’ newest luxury rental collection of hotels, shopping and entertainment community. City Center is a unique and modern urban oasis in the heart of Las Vegas filled with luxury hotels, fine dining and state-of-the-art entertainment plazas.The Vdara Hotel and Spa in Las Vegas will offer all of the exceptional amenities and superior services of affordable luxury that you have come to associate with the Jet Luxury Resorts properties. 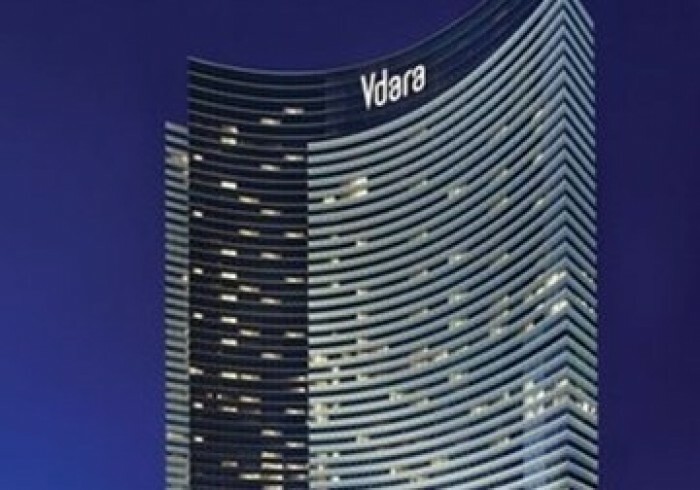 Make Jet Luxury Resorts @ the Vdara “Your Access to Luxury” in Las Vegas. Scroll down for room information.